The 2015 edition of the Back of the Pack Championship Series will go down in history as the most competitive race series in the history of The Alternate Reality. The BPR Crew is distributed (randomly?) around the world, the BPR Crew is focused on The Lifestyle and is focused on Rebelution. 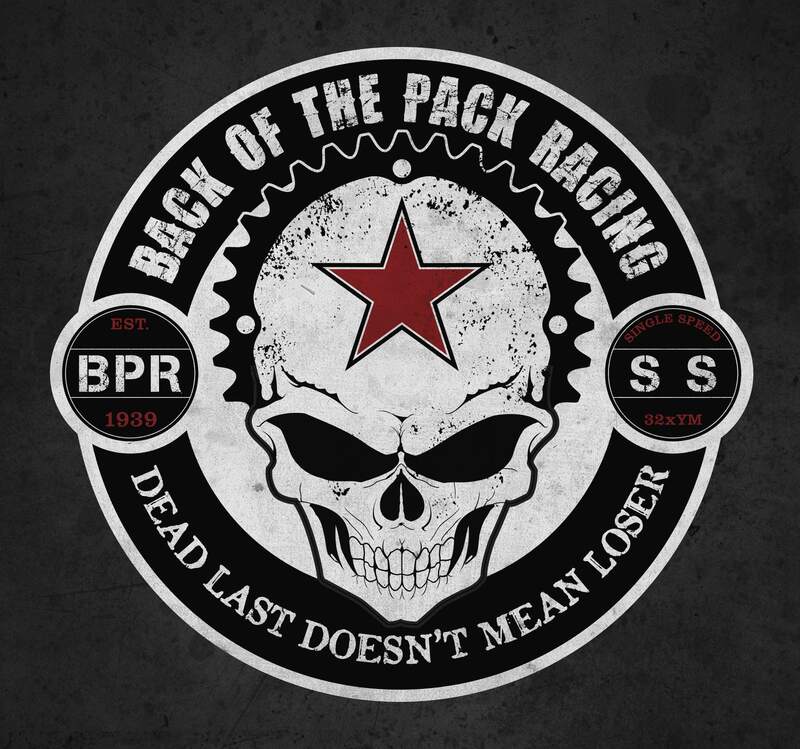 Now the BPR Crew is focused on Down ‘N Dirty racing… Back of the Pack Style. Champions of The BPR Championship Series are known around the world. (well, I’ve won each and every series, so don’t read too far into that statement.) The future Champions will be rewarded with fame and glory. AND maybe: a trophy, a titanium machine, a hug, a night at the Mustang Ranch, a Trip to a future SingleSpeed Championship event, a case of beer or SOMETHING ELSE or NOTHING ELSE. It’s really about fame and glory. Isn’t it? I’ve used my years of algorithm development, data analysis and MY one of a kind organ called The Brain to assemble a simple equation that contains constants, variables and multipliers. You do the racing. I do the computing… with my computational tools. You focus on your performance. I focus on your performance and grade it based on The LifeStyle and The Rules as defined in The BPR Operating Instructions. If math is NOT your forte then just remember this: if you live the BPR lifestyle and FOLLOW the Operating Instructions then you most likely will generate maximum points… based on your level of endurance and ability to navigate ludacracy. If math / equations / algorithms / time varying variables are all contained in your deep dark secret life as a closet geek and hobbyist is the numerical domain then remember this: don’t question me and don’t question The Algorithm. I know what I’m doing. I’m a professional. You’re just an closet geek and a hobbyist in the numerical domain. if the ‘non-Americans’ that roll at the Back of the Pack can’t understand Standard Units… tough s*^t. I’m a United States citizen. I live in The United States. I do not operate in metric units. Yes, base 10 numerics are easy for those that can’t think in multiple dimensions and The Alternate Reality. But I don’t care. If at any time I feel like The Algorithm can be / should be improved or modified then: I will improve or modify the algorithm. BUT I will recompute the BPR Championship scoring and provide a review of the results, the trends, the reality of it all. If you detect grammar errors and or problems with sentence structure then: give me a break. I’m busy. ** for lap races Distancepts = Miles / Lap * Laps. Obviously. The Multipliers will be questioned. But should not be questioned. If the BPR Operating Instructions were followed, without question and without deviations then there would be no multipliers. But because individuals push the boundaries, as suggested by The LifeStyle and promoted by The Alternate Reality, I’m forced into the LifeStyle Multiplier. And since I have one multiplier I might as well throw in a few more. Enough said. Dude. * call The Lt Col if you need a definition of ‘functional’. Or just wear cotton based plaid and cotton based shorts… your choice. * we ain’t doing clothing or ‘kit’ checks in the middle of the race, because we’re racing. that opens the door for those that challenge The Rules and want to be ‘functional’. * explanation: at the back of the pack we suggest that racers race to the end of the race. and those that do will be rewarded with points. therefore, if a racer is out on The Last Lap, the multiplier is 1.5. figure it out. you like to podium, you like to raise you hands above you head when you podium. we don’t understand your actions on The Podium. But we will reward you for The Podium. And a podium is a podium. So if The Podium has 3 or 5 or 10 spots, then you earned points. AND points are scaled on race duration. A win at a 24 hour race will produce the most points: Like 500. Do the math. TheTazFactor is The Taz Factor. That’s all you need to know. Note: if you review the BPR OIs, you’ll realize that The Philosofizer will NEVER earn these pts. *Many Times dudes and dudettes from The Crew show up at races and Run the Show. These dudes & dudettes will be rewarded for their commitment to The Crew and The LifeStyle. The earned points will be based on a secret equation that is controlled by The Philosofizer, The Morale Chairman and Mad Rhino. If you’ve made it this far then… I’m impressed. So, a Real Racer may ask “what is a race that us racers can race?” Good Question neophyte. any race that is organized by an organizer. BUT must be sanctioned by a founding father. Because The Founding Fathers MUST contain the Chapter based Hooliganism. As stated above: the algorithm will be / can be / should be updated at anytime. By me… The Founder, The Leader, The Hustorian, The Philosofizer. But points will be recalculated. As stated above: don’t question the algorithm, just live the lifestyle, turn the cranks and follow The Operating Instructions. Results / Scoring: I will make every attempt to keep current the point total for The Race for The Championship. But I have a job, at The Prison Camp, so ‘current’ is defined by ME. Matrix Representation of The Algorithm: check below in The Appendix: The Details. The Something. If you think your are a freak, that can roll with the BPR Crew, then maybe, just maybe. I’ll create a ‘tourist’ category of The BPR Championship Series. Meaning. 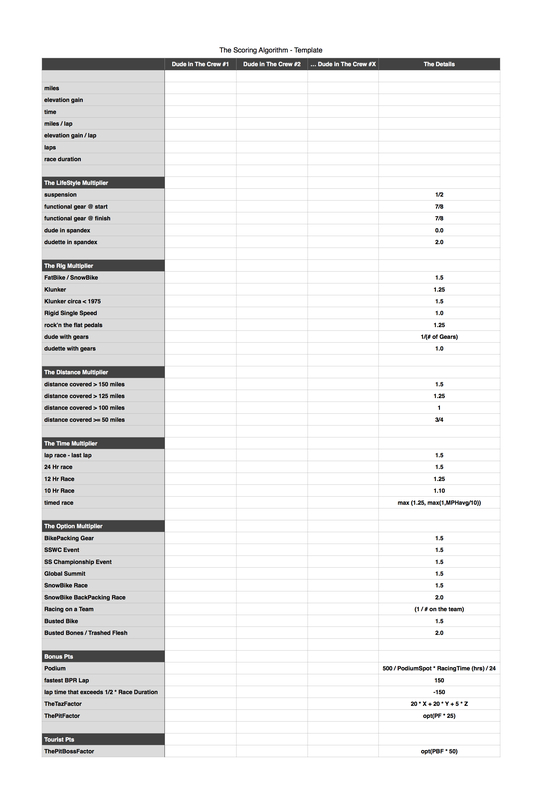 Send me your race info, I’ll track your score with my fancy computational tools. AND, maybe, just maybe, at the end of the year I will determine if you a) are the type of freak that can roll with The Crew, b) live a version of The LifeStyle and can promote BPR Ludacracy. Depending on my view of the world, I may send you some patches and, if required, have you setup a BPR Chapter. Time to go RACE. Dudes. Dudettes. A look into The Scoring Algorithm… which will be implemented with BPR Computational Tools.